When you take a closer look, Japan is one of the world's outstanding nations of performing arts. There are more than Nogaku(Noh/Kyogen), Bunraku and Kabuki that are designated to the Intangible Cultural Heritage. Considerable numbers of performing arts nation-wide are profoundly distinct and highly refined. Noh and Kyogen are two inextricably linked performing arts referred to collectively in Japanese as Nogaku. Noh is the oldest surviving theatrical art in Japan, going back six hundred years. It has evolved somewhat over time, and took on its present form in the mid-Edo period (the Edo period as a whole lasting from 1603 to 1867). Noh was perfected by the feudal warrior class, the daimyo and the samurai, and is the embodiment of the spirit and aesthetic outlook of the warrior. 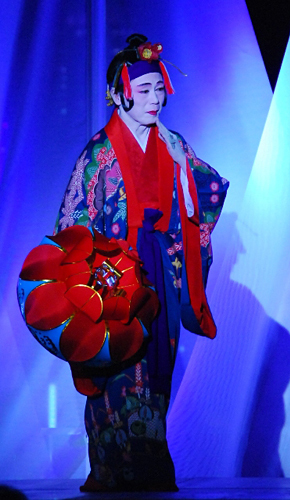 Like the modern Western musical, Noh includes both music and dance, leading some to describe it as "Japan's musical." 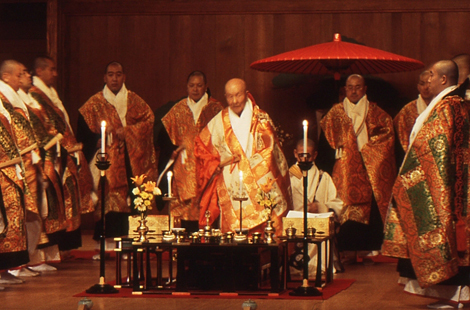 The musical element of Noh is called hayashi, and the singing or chanting is called utai. Both are completely distinct from Western forms of instrumental and vocal music, however. The dance element is called mai, but dance in Noh is quite restrained and the basic locomotion pattern is based on a kind of sliding step in which the foot is not lifted from the stage floor. 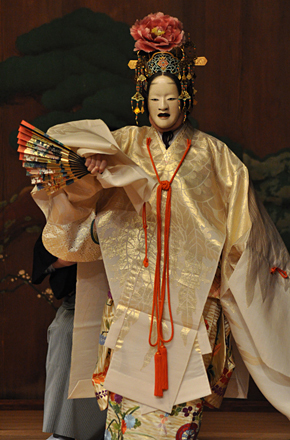 Another feature of Noh that clearly distinguishes it from the Western musical is that all of the actors in Noh are men, and they are frequently masked. 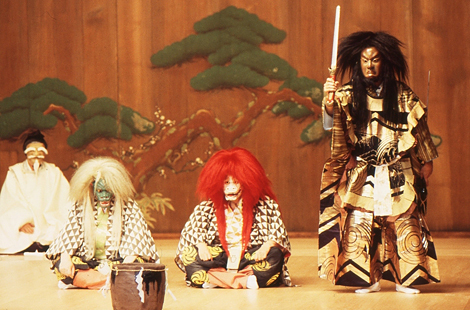 Some people confuse Noh with Kabuki, but in fact they are polar opposites as performing arts. Kabuki is a constantly evolving theatrical form and in that sense is always "imperfect," while Noh is a completed performing art from which all of the extraneous elements have been stripped away, leaving it in a classic, unchanging, "perfected" form. Noh is one of the most Japanese of performing arts and has exerted a powerful influence on Bunraku, Kabuki, traditional Okinawan dance, and other later forms. Kyogen is performed on the same kind of stage as Noh and is a theatrical art with a strongly comic tone. Though the comedic element is emphasized in Kyogen, the full range of human emotions is present in its humor. It is predominantly a spoken form, but includes some song and dance as well. With equal depth and breadth, Kyogen is also a highly refined theatrical genre. Initially a single art, Noh and Kyogen emerged as separate genres in the Muromachi period (1336-1573), with Noh emphasizing song and dance and Kyogen emphasizing the spoken word. Kyogen evolved into the form that we recognize today in the mid-Edo period, when it was perfected to suit the tastes of the feudal lords, or daimyo, of the warrior class. Kyogen is more accessible to the uninitiated than Noh. While a single Noh drama lasts more than an hour, most Kyogen comedies are from twenty to thirty minutes long and easier to enjoy. As a result, there are many programs consisting exclusively of Kyogen at present. In 2001 Noh and Kyogen, in their joint form as Nogaku, were the first Japanese performing arts to be added to UNESCO's initial Intangible Cultural Heritage list as a Masterpiece of Oral and Intangible Heritage of Humanity, and in 2008 Noh and Kyogen were incorporated into the UNESCO Representative List of the Intangible Cultural Heritage of Humanity. Bunraku is the name currently applied to the tradition of puppet theater that has been performed in Osaka, combining spoken and sung narration (joruri), shamisen musical accompaniment, and puppets (ningyo). Bunraku puppets are manipulated by three puppeteers, while a narrator, or tayu, seated on a small revolving platform to the right of the stage delivers the text of the drama, accompanied by a shamisen player seated next to him. The ningyo joruri, as this form of puppet theater was originally known, that appeared in Osaka underwent a rapid burst of development in the Genroku era (1688-1704) of the Edo period (1603-1867). At that time, the playwright Chikamatsu Monzaemon and the narrator Takemoto Gidayu joined forces to create a sophisticated form of puppet theater that was the precursor of today's Bunraku. It is due to them that puppet theater in Osaka became a professional dramatic art with the highest level of music, drama, and techniques of puppet manipulation, distinguishing it from the various amateur and folk puppet traditions existing elsewhere in Japan. It is no exaggeration to say that Bunraku is the most highly developed puppet theater in the world. The puppet theater of Osaka came to be known as Bunraku because in the Taisho period (1912-26), a puppet theater known as the Bunraku-za(za meaning "theater") was the only surviving puppet theater in Osaka. As a result, eventually, Bunraku became synonymous with the tradition of Osaka puppet drama in general. 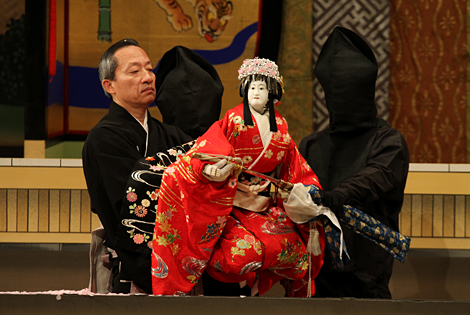 In recent years the original term for this art of puppet theater, ningyo joruri, has lost currency and today most people refer to the tradition simply as Bunraku. In 2003 Bunraku was added to UNESCO's initial Intangible Cultural Heritage list as a Masterpiece of Oral and Intangible Heritage of Humanity, and in 2008 it was incorporated into the UNESCO Representative List of the Intangible Cultural Heritage of Humanity. Kabuki is a theatrical art form of sophisticated and stylized beauty, from the performances and music to its stage sets and costumes. Fostered in the flourishing culture of the townspeople and the merchant class of the Edo period (1603-1867), Kabuki is a constantly evolving art form that has responded with great sensitivity to the changing times, taking on new challenges as it grows and develops continuously. Many of the new directions or adaptations of the previous generation are then passed on to the subsequent one, during which they become, over time, a part of Kabuki. This is Kabuki's secret for remaining fresh and interesting as a theatrical art in spite of its three-hundred-year history as one of Japan's traditional performing arts. 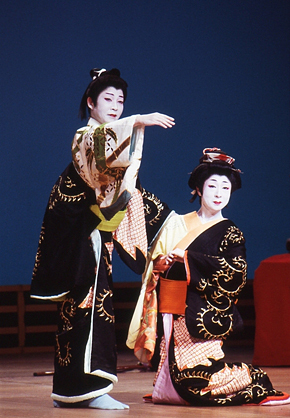 The earliest Kabuki was performed by women, though at present all roles are played by men. Actors playing male roles are called tachiyaku, and those playing women, onnagata. Some actors only play male roles, while others play both male and female roles. The Kabuki repertory is made up of two types of performances; plays and dances or dance-dramas. 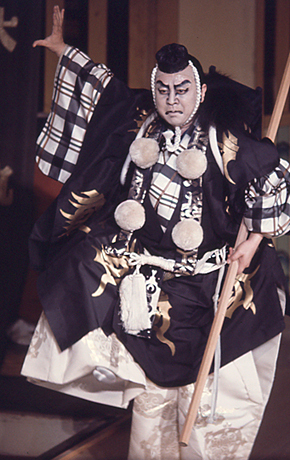 The typical Kabuki program today consists of two dramas and one dance or dance-drama. Performances of both types are accompanied by music, mainly the shamisen, with vocal accompaniment in the form of singing (a genre called nagauta) or narration (such as gidayu). In 2005, Kabuki followed Nogaku and Bunraku in being placed on UNESCO's initial Intangible Cultural Heritage list as a Masterpiece of Oral and Intangible Heritage of Humanity. Its slightly later addition to the roster is an indication that many of its plays originated in the other two theatrical forms. In 2008, all three performing arts were incorporated into the UNESCO Representative List of the Intangible Cultural Heritage of Humanity. Gagaku refers to a genre of music and dance systematized in Japan in the mid-Heian period (784-1185). Many different kinds of music and dance are actually included in this single term. Hearing the word "Gagaku", even most Japanese think of the two kinds of music known as togaku ("Tang Music") and komagaku ("Korean Music"), but actually Gagaku is a much broader category of music and dance. Togaku refers to music introduced to Japan from China and the Asian continent, while komagaku is music introduced from the Korean Peninsula. Both of these were so extensively adapted by the Japanese aristocracy of the Heian period that, for all intents and purposes, they are Japanese music. Gagaku also embraces various kinds of native Japanese music and dance, as well as original compositions by Heian-period aristocrats. Pieces that are purely orchestral are called kangen, and those that include dance are called bugaku. 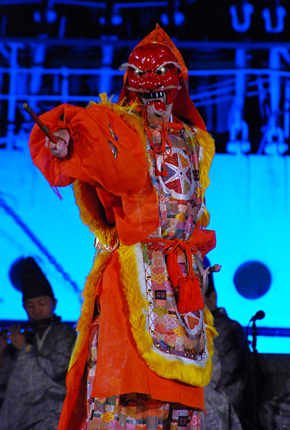 Some bugaku dances are performed with masks. The word "Gagaku" originally referred to the ceremonial music of the Chinese court, which was performed in China outdoors, with large numbers of participants. This tradition no longer survives in China, but we can catch of glimpse of what it might have been like in the ancient ceremonials still performed for ancestors in Korea. While the term "Gagaku" was introduced to Japan, the original Chinese Gagaku music was not. What was called Gagaku in Japan was actually based on the music that was performed as entertainment in the Chinese court, not the grand ceremonial music. Gagaku has been transmitted in Japan as part of ceremonies performed at the imperial court and at temples and shrines, but in recent years its artistic nature has been recognized and it is now also performed in concert halls. Though all Japanese have heard of Kagura, most don't actually know much about it. Written with the characters for kami ("god") and music, it is, literally, entertainment for the native Japanese gods, or kami, and consists of dances and music performed as part of Shinto ritual. Kagura can be divided into two main categories, mikagura, which is performed as a kind of Gagaku in the imperial court, and kagura, which was transmitted among the Japanese people. We will discuss the latter in this section. Kagura can be found throughout Japan and it varies from place to place. In most cases the historical origins of the songs and dances are not precisely known. Kagura was performed to purify the seat to which the kami were invited to descend as well as to entertain the kami. Since the kami were regarded as enjoying anything performed for them, it can be said that any performance for the kami is Kagura. Given the broadness of this definition, it's not at all strange that there should be so many different kinds of Kagura. Generally, Kagura is divided into four categories: (1) dances by shrine maidens (miko Kagura); (2) dramatic performances of myths about the origins of the land of Japan (Izumo-style Kagura); (3) dances performed around a large cauldron of boiling water used to purify the kami's seat (Ise-style Kagura); and (4) dances in which the kami is thought to dwell in a large lion mask worn by dancers who perform to drive away evil spirits (shishi Kagura). The most frequently seen types are shrine maiden Kagura and Izumo-style Kagura. Shrine maiden Kagura is performed at Shinto shrines throughout Japan, and there are many varieties of Izumo-style Kagura as well, such as the Iwami Kagura of Shimane Prefecture, the Bichu Kagura of Okayama Prefecture, the Takachiho Kagura of Miyazaki Prefecture, and the Edo Sato Kagura of the Tokyo area. Kagura uses such instruments as flutes, drums beat with sticks, drums on stands beaten with sticks (shimedaiko), and small copper cymbals called dobyoshi. The flutes and drums are usually played in a lively rhythm in Kagura music. Shomyo is the name for the style of chanting employed by the monks of certain Buddhist schools when they recite the Buddhist scriptures in a half-singing, half-spoken intonation. It resembles plainsong in the medieval Christian church. This style of chanting, along with Buddhism and its texts, originated in India. It's not known precisely when it was transmitted to Japan, but it's thought that some early form of Shomyo was introduced to Japan from the Asian continent at the same time as Buddhism, in the mid-sixth century. Shomyo exerted an influence on later narrative and chanting styles in Japan, such as Noh and the chanting accompanying puppet plays known as ningyo joruri, and in many ways it can be regarded as the starting point of vocal arts in Japan. A wide variety of Buddhist ceremonies are conducted at temples, from daily chanting sessions (gongyo) to special ceremonies held for specific occasions. Shomyo has been transmitted as a part of these ceremonies. In some cases, Buddhist priests walk in procession through the temple grounds during a ceremony, chanting as they move―a particularly impressive sight. The chanting of sutras during such events as funerals or other Buddhist ceremonies is a kind of Shomyo that many Japanese are familiar with. The texts that are chanted―the Buddhist scriptures―are either in the ancient Indian literary language of Sanskrit, in Chinese (read in a special Japanese pronunciation), or in Japanese. As a rule, Shomyo is a capella, but certain sections may be accompanied by rhythmic beats sounded on a hollow wooden instrument set on the floor (mokugyo) or ceremonial bells. Nihon Buyo refers to a specific form of traditional Japanese dance. The term buyo is a recent coinage. Bu and yo are read separately as mai and odori, and they refer to two different styles or categories of Japanese dance. Mai is a dance style in which the feet rarely if ever leave the floor as the dancer moves; odori, in contrast, is much less constrained and focuses on movements, steps, and leaps. The mai of Nihon Buyo developed from the tradition of Kamigata mai practiced as a form of entertainment as banquets and high-class restaurants mainly in the Kayoto-Osaka region, which is referred to as Kamigata. The odori of Nihon Buyo derives from Kabuki dancing. Okinawan dance and the various folk dances performed throughout Japan are not considered a part of Nihon Buyo. There are many different schools of Nihon Buyo today, to the extent that it is often said that there are as many schools as there are dancers. Some have many practitioners, while others are quite small. In addition to geisha, for whom dance is an important part of their profession, many ordinary people study Nihon Buyo as a hobby. The main accompaniment for all types of Nihon Buyo is the shamisen and some form of singing such as nagauta or jiuta, or singing narration, such as kato-bushi, gidayu, tokiwazu, tomimoto, or kiyomoto. The Kamigata mai of the Kyoto-Osaka region is accompanied by jiuta singer playing the shamisen, and in fact another name for this tradition of dance is jiuta mai. Odori is usually accompanied by one of the singing narrative forms such as nagauta, tokiwazu, or kiyomoto. Up to the establishment of Okinawa as a Japanese prefecture in 1879, it was known as the Ryukyu Kingdom, and it had its own unique culture, of which Ryukyu Buyo, or Ryukyu dance (sometimes also known as Ryubu), is a part. Ryukyu Buyo compares with the Kamigata mai (also know as jiuta mai) of the Kyoto-Osaka region as a refined and sophisticated regional dance tradition. 1. Classic dances (koten buyo) that were developed by the warrior class of the Ryukyu Kingdom as part of court ceremonial entertainment. 2. Popular dances (zo odori) that were developed based on the classics after the end of the Ryukyu Kingdom. 3. Modern dances (sosaku buyo ) created after World War II. The main musical accompaniment for Ryukyu Buyo is the three-stringed banjo-like instrument unique to Okinawa, the sanshin. It developed from a similar instrument, the sanxian, introduced from China. The sanshin was the basis for the development of the shamisen in Japan. The Ryukyu Kingdom often played this intermediary role in trade and cultural exchange between Japan and China. The performing arts are a vital part of everyday life in Okinawa, and there is a strong tendency for the people of Okinawa to actually participate in the arts rather than just remain spectators. There are numerous studios teaching Ryukyu Buyo in every Okinawan city and town, and many ordinary people play the sanshin or perform traditional dances at weddings, funerals, and at ceremonies and festivals throughout the year. Since the opening in 2004 of the National Theatre Okinawa in the city of Urasoe, near the prefectural capital of Naha, however, Okinawa's traditional performing arts are receiving deserved recognition as an artistic tradition. The Ainu are the Indigenous People of Japan. It was only about 150 years ago that the Ainu inhabited almost all the land of Hokkaido, Kuril Islands and the south half of Sakhalin. As the Ainu people lived off the land, they have developed a unique relationship with what natural environment offers - animals, plants, thunder and disease - and they considered them as "kamuy" or spirits. 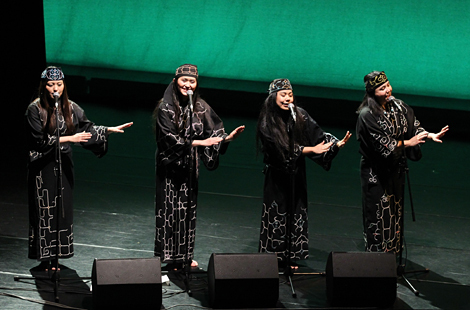 It is thought that the songs and dances of the Ainu people are born through the relations between the Ainu and kamuy. Some songs send prayer to kamuy, some are sung when people gather. There are also improvised songs. Dances vary in kinds as well. Some imitate animals and plants, some are working songs and others are game songs. Jaw's harp called mukkuri is a well-known musical instrument passed down to the Ainu people. There is also a stringed instrument from the Sakhalin Island called tonkori. Currently, Ainu's traditional dances (Ainu koshiki buyo) are designated as Important Intangible Folk Cultural Properties by the Japanese government. At the same time, there are artists emerging mainly in the area of fine arts and music who are expressing Ainu cultures in contemporary fashion while having connections to their tradition. Yokohama Noh Theater is an established art center highly praised for its expertise in crafting productions specific to traditional performing arts. If you have questions regarding Japanese traditional performing arts, please contact us.